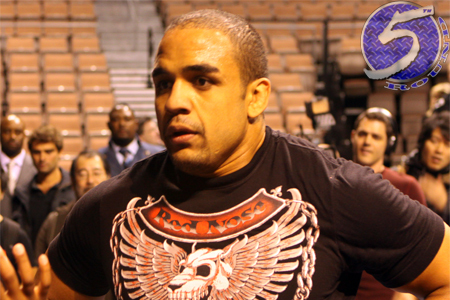 Although California State Athletic Commission executive officer George Dodd wasn’t able to confirm why Rafael “Feijao” Cavalcante (Pictured) flunked his drug test over the weekend, Dodd revealed Monday the former Strikeforce light heavyweight champ screened positive for having stanozolol metabolites in his system during last month’s submission win over Mike Kyle. The 31-year-old has been issued year-long suspension retroactive from his May 19th fight date, $2,500 fine and had his victory overturned to a no contest. Cavalcante earned $66,000 for his win over Kyle, with half of his check coming via win bonus. When news first broke regarding Feijao’s predicament, longtime manager, Ed Soares, professed they intended to appeal the CSAC’s suspension. After posting his second consecutive victory, Strikeforce CEO Scott Coker stated Feijao likely earned himself a shot at facing fellow former title holder Gegard Mousasi for the vacant 205-pound crown. The breaks are now clearly pumped on that notion. Coincidentally, Stanozolol is the exact same substance fellow Brazilian Cristiane “Cyborg” Santos was banned for in January. The former Strikeforce featherweight queen was immediately stripped of her title.